WOW, 32 projects completed in 2008! That is a lot more than I thought I'd do. And out of all those things, only one wadder - a bright pink suede cloth jacket that just didn't make it - trashed before the second sleeve went in. Out of the non-wadders, what are my favorites? Clothing: The Xceptional Shirt by DanaMarie Designs. Quilts: Zman's I-SPY Quilt with alphabet. + Make One Item from Each Burda Plus and/or Burda World of Fashion Magazine Acquired!!!! I have three issues of Burda Plus, with the fourth coming my way in January, plus several BWOF issues. BUT I have been hesitant to actually make anything - the idea of tracing and preparing the tissue seems to be a barrier. But I will overcome this barrier in 2009 and make one thing from each issue I acquire. + Make at least one item for myself from the vintage patterns I've collected!!!! I have a bunch I've picked up here and there. I used the men's pj's for a Christmas present. Now I want to make at least one dress out of the vintage patterns I've picked up. I have two unfinished projects from 2008. Let me tell you about them! First, I am making a quilt for my brother, Mark. It is going slower than I'd hoped. I picked fabrics that are wood grain, and first had to collect several of those. The design is called Carpenter's Wheel: in the traditional design, there are a lot of diamonds. The Easy Carpenter's Wheel uses half-squares and squares, and is easier to put together. I downloaded the design from http://www.quilterscache.com. This site is a great source for blocks and ideas. My intent is to take the design into a third round of diamonds. With four of these large squares, I'll just need to add a border and the quilt will be done. The second unfinished project is my sewing room decor. I have made yards of crazy patch in pink and green. However, I'm still not happy - the green is just too dominating! So I will continue this project. Sew two photos of the projects below. I haven't been blogging in the past week or so, as things have been so terribly hectic. But before the year ends, and 2009 begins, I wanted to update my blog with my Christmas related sewing. First off, the matching tree skirt and table runner I made the weekend before Christmas. The varigated fabric is a Santa head quilting cotton, the dark blue has a tiny little green dot, and the backing for both items (and part of the four patch on the table runner) is a red seersucker with a white dot. The table runner is shown folded in half and runs along the table with all inserts in it, so plenty long enough. I did not use a pattern for either of these. Both will be packed away for future Christmases!!! The second set is not exactly sewing, but it is related. One of the gifts I wanted for DH (or here, headless husband) was out of stock everywhere. So I came up with the idea of printing designs that mean something to him, and applying them to shirts. I found a wonderfully soft all cotton, long sleeve t at Walmart. The first photo is a stained glass window of St. Joan of Arc, the second green is her Coat of Arms granted by the King of France, and the final is a photo of an embrodiery from the Order of the Dragon, which was confered by the King of Hungary. The white shirt is an iron-on transfer, and the other two were printed onto treated fabric, then sewn onto the shirts. Third, is the dress I made for my husband's grand daughter. It was supposed to be for her birthday, but we didn't see her until Christmas Day. This is a photo of her in the dress. 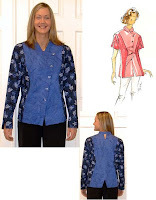 The pattern envelope shows Simplicity 3629, a Project Runway pattern. Very easy to put together. Finally, for my step-son, I made a fleece pullover using the vintage men's pajamas pattern on the left. He really liked it and put it on immediately. In grey fleece, the hems were just turned and sewn. The thing I'd change is the double layer of fleece on the collar and facing - I'd either make it a single layer, or a lighter facing fabric. Well after my late night sewing on Thursday, I was determined to take a break. Maybe follow the example of this little lady, being good and going to bed before Santa arrives. And that determination worked - until about 11:30 last night. Then I got the wild hair to make a tree skirt for the tree in the dining room. It was going to be a simple one - and I guess it was. DH came upstairs just as I whipped out the last stitch, at 2:08 a.m. So that was done. Then this morning, I decided that I needed to make a table runner that coordinated. And, five and a half hours later, I have finally completed a BIG table runner - well all except the binding. I just dropped out - my shoulders hurt from all that sewing. SO tomorrow I hope to finish off the binding, then take photos. I also want to sew a few other things tomorrow, so stay tuned. HELP How do you sew pinch pleated drapery??? OK this is a secret question. I took my mother off the distribution list so I could ask. How do you use pleating tapes to make pinch pleats? I looked at header tape at Joannes, but I couldn't figure out how you would use it. I made curtains before, but never pinch pleats. And mum uses pinch pleats on her window. The fabric I have for this project is about 5.75 yards long - it is 52 wide. She has a window that needs 72 wide and 68 long. I have lining fabric too. Can anyone set me straight?? How do I use that pleating tape?? Yes, I have to admit to a bad bad case of materialism. I've had it for years, and it doesn't seem to leave me no matter what. I have made a resolution that in 2009 I will only use my stash and not purchase new fabric (except perhaps linings when needed). I have one and a half closets full of hanging fabric, four BIG bins full, and several smaller plastic containers. And a pile in plastic bags. I easily have thousands and thousands invested in this stash. I even cleaned some out this summer and donated it to the YWCA's quilting class, and through Craigs List. And I have a double trouble condition, because I do both quilting and clothing sewing. Despite that, I have been contending with a terrible urge to purchase more fabric before my self-imposed deadline arrives. Here are the last pu rchases of 2008- unless someone has a fantastic sale! (LEFT: latest from http://www.equilter.com - five different cotton prints for skirts, including a Celtic warrior, guard in the guard box and the Brit telephone booth, as well as a batik and a bird print) (RIGHT: two Moda "silkies" from the 3 Sister's Faded Memories collection, yellow floral from Simplicity line from Moda, and two "Pumpkins Gone Wild" cottons - don't remember where I got it from!!). And I still have an order coming with a couple more cotton prints - I won a $10 gift certificate from the FABSHOPHOP, then spent a few dollars more! Yesterday I had a double header. I was able to finish two gifts in a single day. First, I finished off the quilt for my daughter-in-law. She requested something "pink and girly" because with the two boys and Oman, she is feeling sort of "boyed-out". I quilted this very very lightly, onto pink flannel. 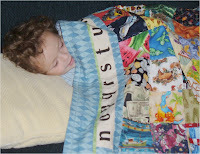 I like this method because it is quick, and the resulting quilt can be used year round. IF YOU ARE RELATED TO ME DON"T LOOK ANY FURTHER IN THIS POST!!!! Second, I made a bike basket shopping bag for my aunt in Vancouver. It is in denim with a nice cotton print lining. I used the instructions for SHOP AND RIDE YOUR BIKE by Craftleftovers (http://craftleftovers.blogspot.com). I made a few changes – I added a purse zipper on the outside of one long side so she can carry papers. I also added thick interfacing in the bottom and quilted it to make sure there is padding. The result is pictured below. The photo on the left is "hot off the sewing machine" and the one on the right is shown with some boxes, to give the "virtual" shopping experience appearance. However, that meant I was sewing until 11:30 last night – and I am pooped. No sewing today, although I am washing fleece I am going to use tomorrow to make overalls for the boys. Aside from lunch with a friend and some sewing, I'm trying to relax. I found this idea on a couple of different sites, so I thought I'd try the "roll up" method of organizing my purse. The first step is to lay out the items you have in your purse. These items totalled 30 inches. I cut my two fabrics 32 inches, sewed them together, then used 7 inches of a very stiff interfacing for the backing. I did not interface the front "pocket". The photo above is of the completed roll up from the back. The one below shows a close-up of the roll up pockets. The first photo is the final product and here it is in my bag (the Christmas bag from Thanksgiving weekend). In playing with it a bit, I found that a looser roll, that was longer, actaully worked better as it filled the purse more completely. Mr. Security, my husband, contends it makes things easier for the bad guys to just grab and go, However, I think I am going to like it. You can "roll up" the roll up to different lengths and widths. The only problem I encountered was that once I put the pockets in, I discovered I hadn't allowed enough room for the "width" of the various items. So I ended up one pocket short. I think I am going to like this, as your various items stay in place and are easy to find. I hate pawing through everything looking for something. This should help. This weeks sewing . . .
All week I've been working on this gift for my friend in England. it is a large tote with several pockets, and a work carrier tube. Both designed to allow quick and easy travel sewing. It is made with a variety of 1930's repro fabrics in green and yellow. The white is a matelese type fabric I've had for a number of years. The tube or roll is quite interesting. It uses a regular mailing tube, covered with a quilted piece that can be rolled around the tube. The idea is that you take your quilt squares or embrodiery or whatever you are working on, and roll them to keep them clean and unwrinkled. I left one tube end uncovered so that little items could be stored in it. I really enjoyed making these items, although it took longer than I expected. For the tote, I cut squares that would allow me to put the entire tube into the tote. The front has half of a Dresden Plate design. There is a three opening pocket on the outside of the back. Inside, there is another three opening pocket, and one large pocket that has a snap to close. A few weeks ago I mentioned having purchased a used Husquvarna Designer. I finally got it set up and used it yesterday and today. First of all, I love the quarter inch stitch - it is exact and makes it much easier to make an accurate 1/4 inch seam. And the auto lift is difficult to get used to, but after several hours of sewing, I think I am ok with it - I didn't reach back to lift the foot the last hour or so I was sewing this evening. I knew a few of the stitches don't work, and I was disappointed that the stipple stitch does not work. However, with the free motion, I should be able to stipple without a preset pattern. I haven't tried free motion as yet, but I did buy the Harriet Hargrave book on machine quilting today to get some ideas about the best process for achieving a good look. So, right now, I say my purchase was a good choice. I am now thinking about selling my Viking 500 that I bought in 1997 or 1998. It is in great shape and has been a wonderful machine. A used one on Ebay sold today for $615, so that is a good indicator. Two of the many elements of the Super Secret Sewing Project. This is a Christmas present for a good friend. Since I don't want her to know about it, I removed her from the email list for now. So don't tell. This is a really great project and I think I will be making a tutorial out of it after the holidays. A very useful thing for the sewist, and make use of things that might otherwise be discarded. I'm very excited about this project and really think it will be fun. I hope to have it complete by Wednesday, so I can show a final photo and get your comments. As promised here are photos of the two tops I made this weekend. I will add them to my reviews at http://www.patternreview.com/ this evening. This is actually the second one I sewed on Saturday night. It is not the view shown on the pattern photo (with the sort of "keyhole" yoke) but the second one shown. I made it from a cotton and lurex fabric I got on clearance this fall. Something about it seemed "Christmas-y", although now that it is made, perhaps St. Patrick's Day would be more appropriate! I started with a dark green paisley print for the yoke, but could not get it set in correctly. I finally tossed it and cut another yoke from a piece of complementary fabric. I had four one inch strips of the dark green left, so I ironed a crease in it and set it under the new yoke. What I finally did, because the directions made absolutely no sense to me, was to then overlay the yoke on the top, pin into place, and sew into place. I then used three different threads - a dark green buttonhole twist (from the 80's??!! ), a metallic dark green, and a medium green rayon - to decorate the yoke. I used the curvey S stitch, and each time I went around, I switched the stitche length and width to get different types of "s" designs. It is very loose, and now that I see the photo I may put the elastic in the cuff to draw that in a bit. But it is comfortable and will be great both summer and winter (with long johns under!). I love this top. I originally cut it out in late February or early March, with the intent of making it to take to Vancouver with me. I ran out of time, then the weather caught up with me and I did not get it made. I was determined to get it done over Thanksgiving weekend however. It took a lot longer than I thought it would - there are facings on the hems and sleeves, as well as the back "V" that have to be interfaced and then sewn on, then topstitched in place. However, it was worth all the work. I was concerned about the buttons and buttonholes on this angled front, so I put snaps on instead - and it works well. I stitched the buttons on top of the snaps on the front, and I think it looks great. I wore it out to the grocery and a quick trip to the bookstore tonight, and got three compliments on the top from strangers. So it must be a good selection! I will be making more. So that is my collection from Thanksgiving weekend - two tops and a purse - not bad.